All packages are customizable. Here is a one to get you started. Any option can be added or removed to your specifications. Custom woodwork, electrical amenities, and a ventilation system controlled by two ceiling exhaust fans will make your next weekend excursion luxurious. Using three 100 Watt solar panels we harness the power of the sun to outfit your van with electricity. After panels charge your two insulated batteries you can run your LED lighting, switches and USB/cigar outlets completely fossil fuel free. No need to worry if your dirt follows you in after your adventure, your laminate flooring will be easy to clean. Then you can rest comfortably in your custom made bed frame, surrounded by insulated cedar paneling, a cozy retreat from the great outdoors. 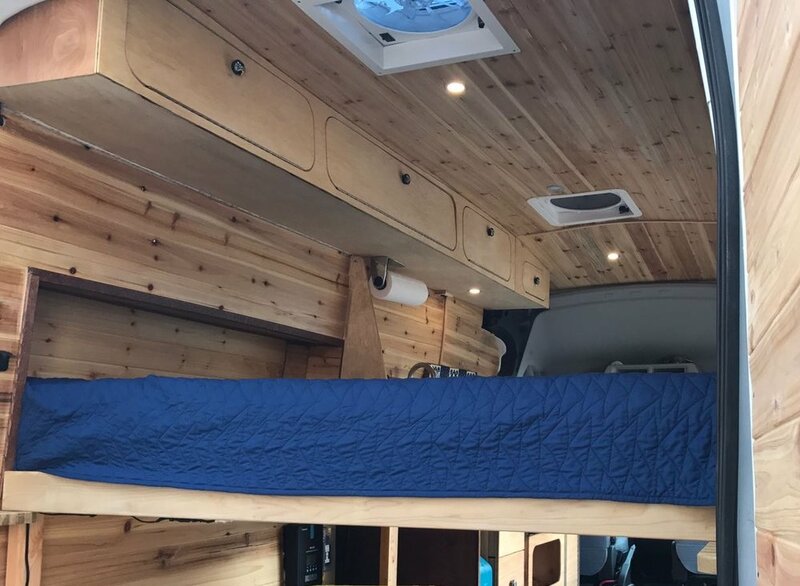 Our Full Conversion is the entire basic conversion combined with all recommended add-on accessories, to make your van the perfect fit.